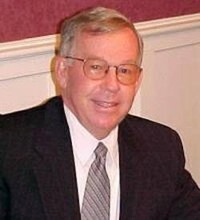 St. Albans - Howard George Heald, 70, a lifelong St. Albans resident and well known Funeral Director, passed away peacefully early Sunday morning, December 3, 2006 at Northwestern Medical Center following an illness of a few months. His loving family was at his side. He was born in St. Albans on February 4, 1936, the oldest son of Raymond W. and Barbara (McCarron) Heald. In 1954, while attending the University of Vermont, Bud met Margaret Katherine Arnold of Bayshore, NY. They were married on August 16, 1958 in East Islip, NY. Bud was a member of the class of 1954, Bellows Free Academy, attended the University of Vermont and after his military service graduated from Simmons Mortuary College in Syracuse, NY. Bud was former Co-owner and President of the Heald Funeral Home where he was employed for over fifty years. He was a director of the Peoples Trust Company, a Trustee of the St. Albans Bay Cemetery Association for over 35 years, and a past President of the Vermont Funeral Directors Association. He also was a Past Master of Franklin Lodge #4, F. & A.M. and a member, former Deacon and Trustee of the First Congregational Church. He was a member of Champlain Country Club, the Board of Incorporators of Northwestern Medical Center and a 27 year member of St. Albans Lodge 1566, BPOE. He was a charter member of the eight-o-clock coffee group which has been meeting for over 35 years. He served his country proudly in the United States Marine Corps and was a member of Green Mountain Post #1, American Legion. Besides his best friend and wife of over 48 years, Peg, Bud is survived by three children; his son, Raymond A. “Rett” and his wife, Emily of St. Albans, daughters, Elizabeth J. “Bet” Howrigan and her husband, Harold John, Jr., of Fairfield, and Dr. Barbara F. “Barb” Fowke and her husband, Mark of Auburn, NH, seven grandchildren; Christopher Jon Heald and his friend, Danielle Messier of St. Albans, Meghan Elizabeth Heald of St. Albans, Harold John Howrigan III, Brendan Anthony Howrigan, Amy Elizabeth Howrigan and Adam Phillip Howrigan all of Fairfield, and Thomas Fowke of Auburn NH, two brothers and their wives; Winslow R. and Sheila Heald of St. Albans, Stephen W. and Patricia Heald of Shrewsbury, MA, a sister and her husband, Sandra B. and Robert Pratt of Westfield, MA. Also several nieces, nephews and cousins. No where will be found more kind or gentle people than the friends, neighbors, co-workers and doctors and nurses of the Northwestern Medical Center who have helped to make these last few weeks easier for Bud and his family. A funeral service will be held on Thursday at 11:00 A.M. in the First Congregational Church on Church Street in St. Albans. Pastor Judy Steger Kennedy Will officiate. Following private interment in the Heald/Arnold Family lot in St. Albans Bay Cemetery, Bud’s family will join all who wish to come to the American Legion Hall, Parah Drive, St. Albans for a time of refreshment and sharing. Public visitation will be on Wednesday from 2-4 and 7-9 P.M. in the Heald Funeral Home, 87 South Main Street, St. Albans. Those planning an expression of sympathy are asked to consider either the Palliative Care Program at Northwestern Medical Center, Fairfield St, St. Albans, VT 05478, or Franklin County Home Health Agency, 3 Home Health Circle, St. Albans, VT 05478. Assisting Bud’s family are his many friends in Funeral Service. Condolences and memories may be sent to the family through www.healdfuneralhome.com. It is with deep sadness that we share with you the loss of our husband, father and friend. 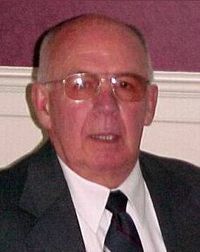 St. Albans - Winslow R. Heald, 72, a lifelong resident of St. Albans passed away peacefully on September 4, 2011, at his home with his devoted wife and loving daughters by his side. Win was diagnosed with an aggressive form of brain cancer in April and faced that challenge bravely and completely to the end. He was born in St. Albans, the son of Raymond W. and Barbara (McCarron) Heald on February 26, 1939. On October 10, 1981, he married Sheila Connor of Fairfield. Win was co-owner of the Heald Funeral Home, which was established by his grandfather and namesake, Winslow D. Heald in 1918. He was employed by Mississquoi Corporation in Sheldon as a laboratory technician until 1967 when he joined the family business. Win then attended mortuary school at the New England Institute in Boston where he graduated with highest honors and was the recipient of the Founder’s Award. He was also elected to Mu Sigma Alpha National Honor Society. Upon his return to St. Albans he and his brother Bud purchased the funeral business and were partners until Bud’s death in 2006. Win was a member of the Vermont Funeral Directors Association and National Funeral Directors Association. He was also a member of St. Albans Lodge#1566, BPOE, past master of Franklin Lodge #4 F& A M, Champlain Country Club and Stonegate Golf Club in Florida. Though Win will be buried in his family’s lot in St. Albans Bay Cemetery, he volunteered for 40 years overseeing Greenwood Cemetery on So. Main St. He held various positions on the board of directors and he took great pride in the results of his efforts. Win had many skills and talents which he shared with those he loved He especially enjoyed woodworking, cooking, golf, fishing and playing pool. Win was a man of honesty, integrity, and compassion. His advice was often sought by those who knew and respected him. His sense of humor was a gift that will always be remembered. Win’s positive energy and zest for life were an inspiration to us all. In addition to his wife, Sheila, he is survived by a daughter, Maureen Heald of Milton and a daughter & son-in-law, Susan and Dr. Marc Golden of Sidney, Maine. He also leaves three grandchildren, Caitlin and her husband, Josh Leggett of Bristol, VT and their sons, Sawyer and Shamus. A grandson, Ryan Gadhue of Burlington, VT and a grandson, Keenan Golden of Sidney, Maine. He leaves a sister and her husband, Sandra and Robert Pratt of Westfield, MA, two sister-in-laws, Margaret “Peg” Heald of St. Albans and Patricia Heald of Shrewsbury, MA. Win is also survived by many nieces, nephews, and cousins. In addition to his parents, Win was predeceased by his brother, Howard “Bud” in 2006 and his brother, Stephen in 2009. A funeral service will be held on Sunday, September 11, 2011 at 2:00 pm at St. Paul’s United Methodist Church. The Reverend Dr. Marguerite Gage will officiate. Private interment will follow in the St. Albans Bay Cemetery. Visiting hours will be held on Saturday, September 10, 2011 from 3-8 pm at the Heald Funeral Home, 87 South Main St. in St. Albans. In lieu of flowers, for those who wish memorial contributions may be made to Franklin County Home Health Hospice Program, 3 Home Health Circle, St. Albans, VT 05478. Private messages of condolence are welcome at www.healdfuneralhome.com.